Stuck In The Buckosphere: STORMS: Round two and three today. We saw some strong storms yesterday across Northern Ohio and today we will see the Southern portions of Ohio get their shot. 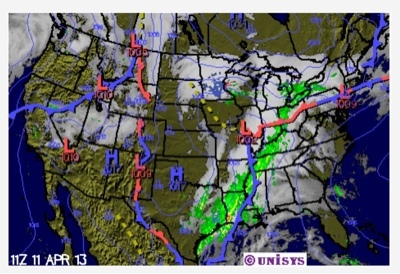 The stationary front was sitting across the North yesterday and the rain was just riding along it. Today that will be met by the strong cold front from the west. 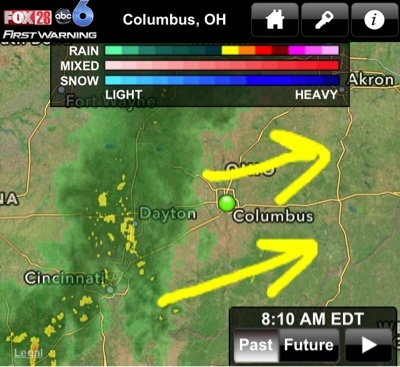 The wave of rain from last night is moving across Western Ohio currently. This will mainly stay as light to moderate rain for the first half of the day. As our temperatures warm with daytime heating it will help fire up some storms ahead of the main line. I added the Future Radar for 6:30PM and 7:15PM to the bottom. The way the models are showing it, there is the main threat for strong winds an hail, but the leading edge could have some embedded tornadic storms, however the strongest of the tornadic storms will be across the Deep South. The good news is that the steady morning rain will help to diminish the threat for afternoon storms and push the threat to FAR Southern Ohio. Stay informed and keep the coat handy for this weekend when our temperatures drop for the weekend.